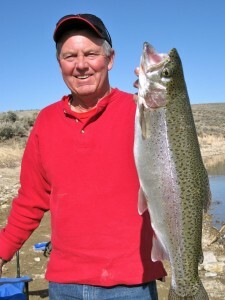 Join us for a fantastic fishing trip to Northeast Nevada. These are usually two-day trips in March through June. The number of days depends on the angler. We fish a couple of different lakes, but both represent fantastic fishing opportunities! We can customize trips to your schedule. Included in this trip is transportation once at Elko to the lakes, lodging in the local Red Lion owned casino and guiding service (bank fishing). This is a great get-away for couples or groups of friends. Expect to catch fish ranging from 14-24” generally in the 2 ½ to 4-pound range and sometimes up to 6 pounds! The German Browns and Rainbow trout are as strong as you can imagine, and make for an exciting couple of days of fishing. Lunch and soft drinks will be provided when fishing the entire day. A three-day fishing license is extra. Whether you are getting away with the family or putting together a fishing and gambling trip with your buddies, Northern Nevada is a secret when it comes to quality fishing for quality fish! Come and see what the mountains of Nevada have in store for you!